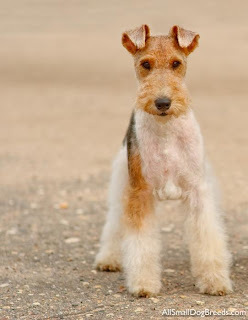 One of my favorite terriers is the Wire Fox Terrier. With the fun, friendly personality and great show stopping looks, they are amazing to see! This was the breed that won the 2011 National Dog Show dog’s name was GCH CH Steele Your Heart. I think that he is one of the most fun to watch show dogs I have ever seen! Ch. Matford Vic, a Wire Fox Terrier, is one of only five dogs to have won the Westminster Kennel Club Dog Show on more than one occasion. He won the competition twice, in 1915 and 1916. The only dog to win it on more occasions was Ch. Warren Remedy, a Smooth Fox Terrier, who won it on three occasions between 1907 and 1909. Although it bears a resemblance to the Smooth Fox Terrier, they are believed to have been developed separately. Two of the Wire Fox Terriers' most distinctive traits are their enormous amount of energy and intelligence. They have a low threshold for boredom and require stimulation, exercise and attention. Indeed, once absorbed into the family, they are an inquisitive pet with a nose for everybody's business. They particularly enjoy comfort time on the couch or in bed in the evening. The wire fox is a true companion animal. Most of them love water and are always up for a swim. A life jacket is recommended for them. 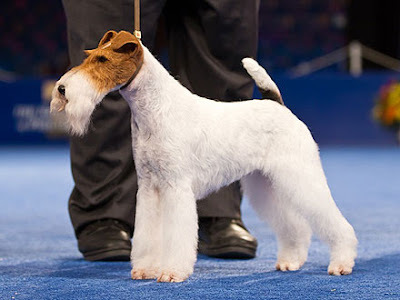 The Wire Fox Terrier should be alert, quick and ready to respond swiftly with enthusiasm. However, they should also be friendly, communicative and exceedingly playful if they receive the proper care and exercise. Bred to be independent thinkers, they are capable of tactical maneuvering for vermin and other sport. Their stamina, energy and level of intelligence are unusually high. But before being seduced by these clever antics and independent ways, prospective owners should attempt to understand the breed's willful nature. 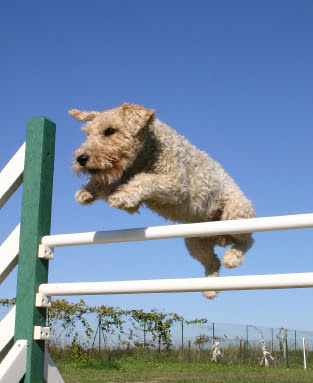 Often, Wire Fox Terriers are abandoned or surrendered for reasons that may include running away instead of coming on command, chasing cars, bicycles, etc., taunting and then attacking other animals, including a household's cats and other dogs -- and they are sufficiently strong with more than enough bite pressure to do serious damage. But these are actually normal behaviors for a breed designed to hunt not only foxes but also badgers and boars, with no more fear of cows or buses than they have for small prey. With a firm owner to control and redirect these prey instincts and provide them with enough exercise and diversion, Fox Terriers are amusing, exciting, long-lived companion animals -- but they are not for everyone. Although it is said Queen Victoria owned one, and her son and heir, King Edward VII of Great Britain did own the wire fox terrier, Caesar. At the foot of the tomb of Edward VII in St George’s Chapel can be seen the curled up figure of Caesar, a wire-haired fox terrier and the King’s favourite dog. Caesar was Edward VII’s constant companion, following him everywhere and travelling the world with him. His collar read “I am Caesar. I belong to the King”. Such was Edward’s love of his scruffy sidekick that he had Faberge make a trinket of Caesar, which was given to Queen Alexandra. Caesar might not have been popular with everyone, but Edward loved him. The wire fox terrier was not popular as a family pet until the 1930s, when The Thin Mans series of feature films was created. Asta, the canine member of the Charles family, was a Wire-Haired Fox Terrier, and the popularity of the breed soared. Milou (Snowy) from The Adventures of Tintin comic strip is also a Wire Fox Terrier. 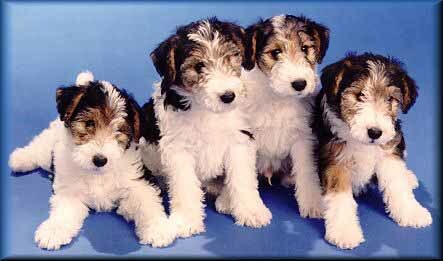 Here are some noteworthy Wire Fox Terriers! 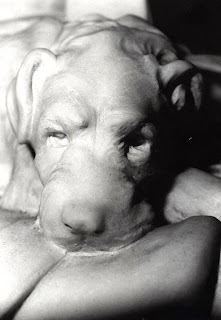 Dášeňka, the dog of Czechoslovak writer and journalist Karel Čapek - also featured as main hero of "Dášeňka čili život štěněte" book. Moll, from the book "Memoirs of a Fox Hunting Man"
"The dog," from the Selchow and Righter board game "Mr. Doodle's Dog"
Asta, George, Mr. Smith and Skippy were all played by the canine actor, Skippy.